This week is all about the basics of horizontal bone loss and vertical bone defects on radiographs. When identifying horizontal bone loss you must first go through the same steps of evaluating normal bone appearances (last weeks post). The two lines (adjacent cemento-enamel junctions and crest of the alveolar ridge) will still be parallel. 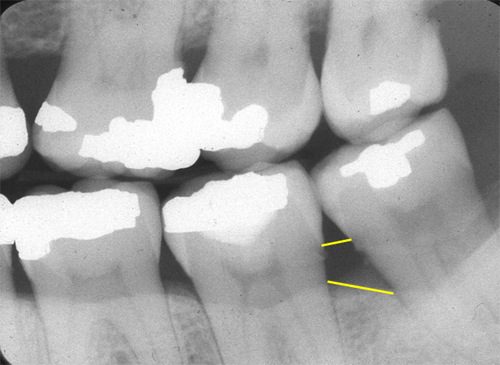 The only difference for horizontal bone loss is that the crest of the alveolar ridge is more than 2 mm apical from the cemento-enamel junction. Vertical bone defects present when the line from the adjacent cemento-enamel junctions and the line of the crest of the alveolar ridge are NOT PARALLEL. 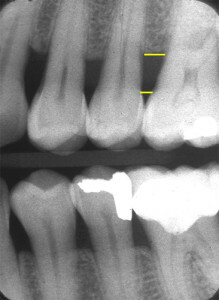 The vertical bone defect is typically described by the tooth and surface where more bone loss is evident.